What is one interesting or fun fact about yourself? I have a twin brother who is one minute older than myself who attends UW-Lacrosse. What types of responsibilities do you have at Edge? What types of projects do you work on? I spent my time at Edge Consulting Engineers as an Environmental COOP and a Design COOP. I primarily worked on Phase I Environmental Site Assessments for proposed cell tower sites as well as commercial properties. I also participated in a Phase II environmental site assessment to investigate a site for potential contamination. I also participated in NEPA compliance work in the form of conducting research for archaeology reports, drafting public notices, and performing historic site screenings for proposed towers. I also spent a considerable amount of time assisting the drafting department with developing site construction drawings for antenna colocations, antenna updates, equipment installations, and fiber shelter constructions. What have you learned from your co-op experience and how do you expect to use it in your future career? I have learned about how important communicating between individuals and teams is when an industry, like telecommunications, requires multiple departments to work together on one project. The project managers, design team, environmental team, structural team, and civil team all have to be on the same page to ensure that clients are receiving deliverables that are not only created with diligence, but that are created promptly. I also believe having multiple teams working so closely together creates an environment that educates the company as a whole on how to work together in a way that will not cause one team to impede on the timeline of another team. I will apply this to my future career by ensuring that I am not a person who creates problems with a project through a lack of communication, as it can lead to compounding issues later down a project’s timeline. 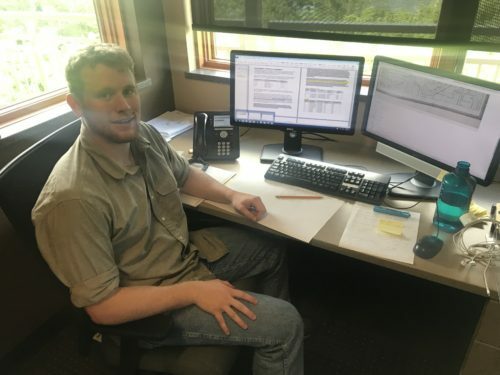 Tanner works at his desk, which overlooks the beautiful Wisconsin River. What has been most surprising about your co-op so far? I learned how many items there are surrounding compliance and the regulation behind site assessments that you are unable to learn in college without job experience. There are certainly not many college classes that teach ESA standards or NEPA compliance, so I am fortunate to have been exposed to the world of environmental consulting and compliance as it is the industry I would like to go into after graduating from college. Was there a specific project/experience you found enjoyable? My favorite experience was traveling to Minnesota to perform small cell site walks and screenings for archaeology and historic sites at the Minnesota SHPO (State Historic Preservation Office), which was an overnight trip. It was very interesting to research historic sites for a project, and then observe those historic landmarks in person from the proposed project site. I specifically got to view a historic rock structure from a proposed project site, and knew the history behind it from the SHPO records I had viewed. I felt like I was really immersed in the project and fully understood why compliance is important. What advice do you have for future co-ops? My advice is to be open to working with different departments to learn more about all aspects of the company. I was often able to work on the Phase I’s, archeology research, public notices, and construction drawings associated with the same sites, which allows you to gain a large picture view of the process a project goes through at Edge Consulting in order to create tangible deliverables that will all come together to create a final product, such as a constructed telecommunications tower. Christian golfs with other Edge employees at the annual golf outing. I’m an avid disc golfer. I got into it about 4 years ago and it has been my go-to activity ever since when I’m looking for something to do. I mainly work on drafting construction drawings and tower inventories for tower sites. I also had to do few site walks, where I had to take pictures and record what equipment was at existing tower sites. I think one of the most important things I have learned from my time here is definitely time management. In the past, I have struggled with procrastination, but now with the amount of projects that I was expected to do each week I was forced to learn how to manage my time better. That will, without a doubt, be a highly important skill in any future career I have. I would say the most surprising thing about my co-op has been the amount of responsibility I have been giving. Each week I’m assigned a list of projects to complete that I am expected to complete on my own. Even when I went out on site walks I was sent out alone to record what we needed, which I felt was a big responsibility. It’s difficult to pick a single project that really sticks out to me, they were fairly similar. I feel like the best advice is the most obvious advice, ask questions. There will be times that you will need some help with a project. Fortunately, everyone here is more than willing to help out with any problem or question you may have. 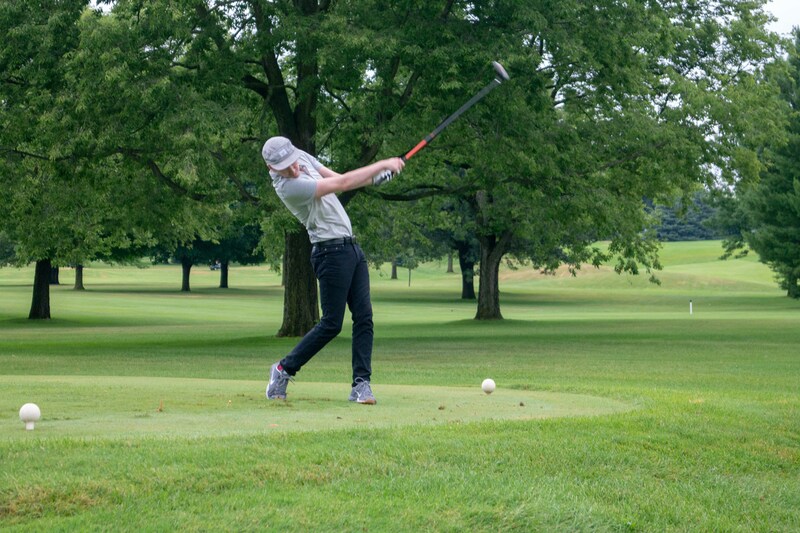 Tyler is pictured on the right at the annual Golf Outing. 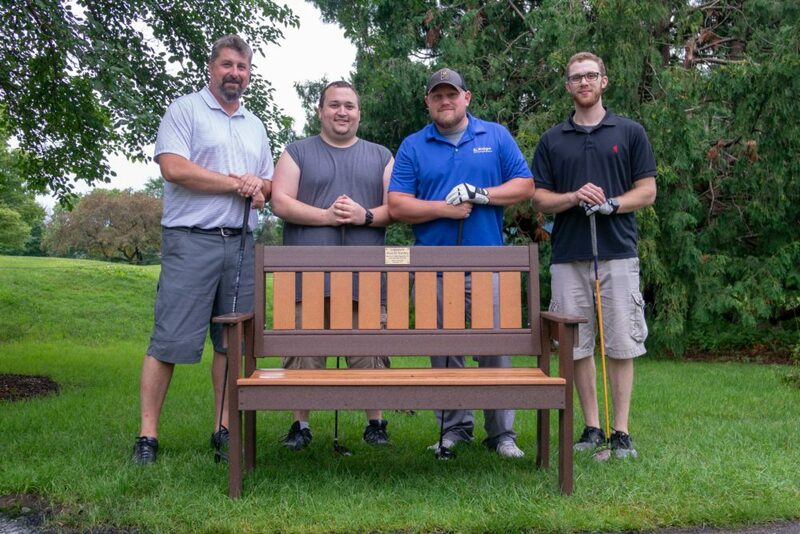 Tyler is in the black shirt next to a bench in memory of a former Edge employee, Bruce Kiesling. I’ve been to 3 countries and 35 states and am planning a trip for next summer to visit at least 5 more states. I work with the structural team analyzing towers, mounts, and small cells. I definitely learned about the importance of communication and asking questions. Often times you will see something in a different way from the engineer or project manager, and communication is key to making sure everyone is on the same page. The company atmosphere. For being in such a large, fast-paced industry, the company keeps the small company, casual feel. The regular company events are fun and everyone looks forward to them. Being able to see projects that you worked on getting completed. I took a couple measurements on the Platteville water tower to help complete the structural analysis. Then a couple months later, I saw the work getting completed. It was cool to see how the work ties into areas you are familiar with. That, and driving down the road and pointing out a tower you worked on. Ask questions. You will learn a lot of information in a short amount of time and it may seem overwhelming. Everyone here understands that and is patient and willing to help you sort through and understand how all the pieces fit together. 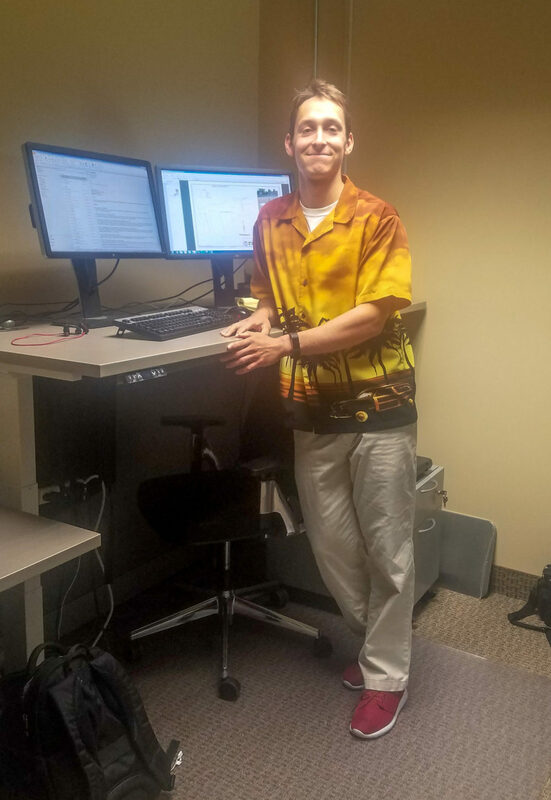 Will stands at his adjustable desk at the Minnesota location. I’m a big local sports fan, my favorite teams being the Lynx and Timberwolves. Last year, a friend and I started a podcast that covers the wolves. Once the season kicks in, we spend lots of our free time watching games, crunching numbers, and recording episodes. I do CAD drafting in Bentley Microstation for MN Small Cell projects, which involves drawing the elevation, location, and other important details of a pole that will be equipped with telecommunications equipment. Each week brings something different from brand new projects to environmental reports and updates to old drawing sets. In addition, I’ll occasionally do site walks to make measurements and take pictures of poles for small cell use. While at Edge, I’ve learned a lot about the telecommunications industry and have gained helpful technical experience using Microstation. 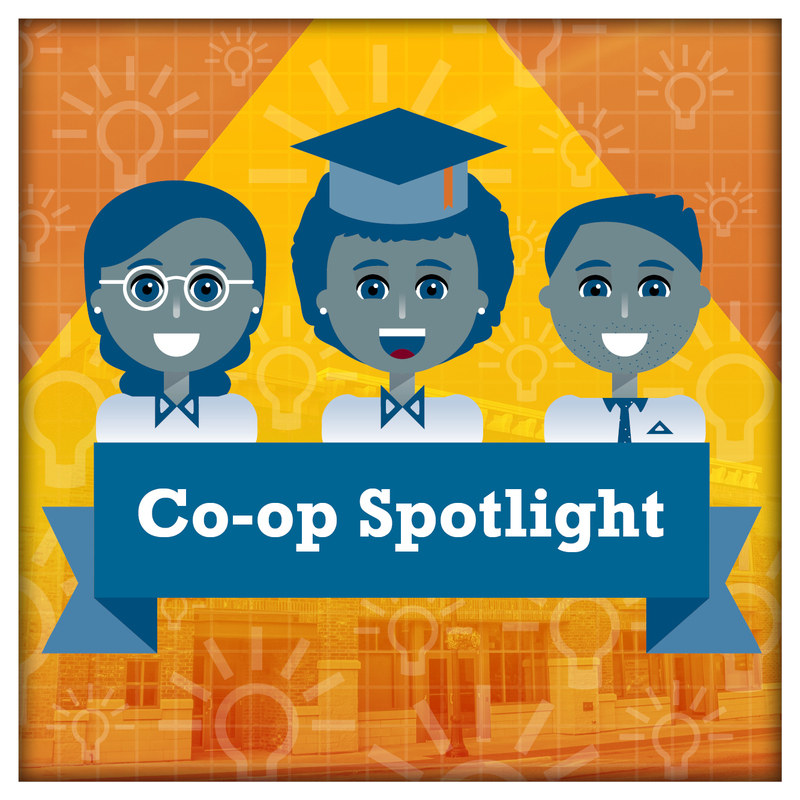 The most useful aspect of this co-op experience, however, has been learning how to balance multiple tasks and prioritize projects. This technical experience and project management will be very useful in my future career. I think the learning curve came surprisingly quickly. I could not have imagined learning so much about small cells and drafting in such a short span of time. It wasn’t far into my co-op before I felt like I had a solid base of knowledge and was taking on real responsibilities for our team. I enjoyed opportunities in which I was able to save pieces of projects that others could use in the future. For example, if a new piece of equipment was becoming standard, I would draw it up from a specification sheet and develop a detail for our standard sheets. I saw this as a great way to make an impact and save time for other drafters. I’d advise future co-ops to do a task right the first time and don’t rush. It’s best to learn to do something properly the first time rather than to spend time fixing errors. There’s nothing like the feeling of getting a drawing set approved without any typos or simple mistakes! What do you like, or has been most beneficial, about the office remodel? I really enjoy using the standing desks in the basement. It’s also nice to have more of the space filled out now that there have been a few hires this year. The remodel has been ongoing since I joined in January so it’s been exciting to see it progress.